A western online shooter that makes the player act as outlaw gunslingers and take part in fights at the Wild West scenery. Developers from Switchblade Monkeys studio prepared six different characters with unique skills and equipment, including guns. Secret Ponchos is a western online shooter and a debut project of Switchblade Mobkeys studio, which was established former employees of Blizzard, Hasbro and Radical Entertainment companies. Secret Ponchos for PS4 and PC doesn’t offer any sort of campaign, focusing solely on multiplayer matches. We play as outlaw gunslingers and take part in battles on Wild West. There are six characters to choose from with various skills and equipment. Developers prepared complex battle system, with not only guns, but also various melee attacks, and barrage fire plays key role during skirmishes. We observe the game’s world through a camera far above the characters’ heads, and the game stresses the tactical usage of surroundings; as maps are filled objects that can be used as a cover and most of them can be destroyed. There are several game modes in Secret Ponchos. We can take part in classic deathmatch, either fighting by ourselves or as part of one of two gangs. There are also the duels – for those who want to feel like gunslingers competing in gunfights at high noon. Each victory earns us reputation point that can be spent on skills’ upgrades and better equipment for our gunslingers. 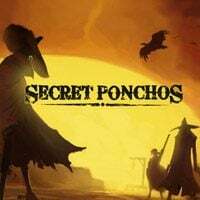 Secret Ponchos for PS4 and PC uses visual style that resembles slightly humorous version of spaghetti western movies, which is complemented by soundtrack inspired by compositions of Ennio Morricone.